Bu çalışma, bir meslekte deneyimli ve bir mesleğe yeni başlamış öğretmenin geri bildirim uygulamaları hakkındaki deneyim ve gözlemlenebilir düşünceleri arasındaki ilişkiyi incelemek, geri bildirim uygulamaları ardındaki sebeplerini analiz etmek için gerçekleştirildi. Bu çalışmada örnek durum inceleme metodu benimsendi. Veri, 15 haftalık bir zamanda, öğrencilerin yazıları üzerindeki geri bildirim analizlerine dayandırılan anımsamayı sağlayan görüşmeler (3 kez), yarı yapılandırılmış görüşmeler (2 kez), ve ders gözlemleri (3 kez) ile toplanmıştır. Ayrıca, her bir öğretmenin bir dönem boyunca vermiş olduğu geri bildirimi içeren 10'ar öğrenci portfolyo incelemesi de yapıldı. Portfolyolar Ferris (2007) tarafından önerilen analiz sekline göre değerlendirilmiştir. Sonuçlar yeni ve deneyimli öğretmenin çeşitli sebeplerden dolayı geri bildirimin verilmesi gerektiği görüşünü ortaya çıkardı. Ek olarak, öğretmenlerin dönem boyunca geri bildirim verirken ana odak noktalarının bazı sebeplerden dolayı gramer olduğu görüldü. 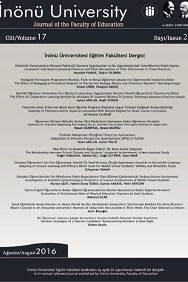 Öğretmenlerin geri bildirim uygulamaları arkasındaki sebeplerin; i öğretmenlerin yazıya ve hatalara karşı olan tutumları ve öğrenci ile kendilerinin yazıdaki rolleri, ii aldıkları eğitim ile deneyim ve iii kurumun yaptırımları olduğu bulunmuştur. This study explored written feedback beliefs and practices and their underlying factors from one novice and one experienced ESL teacher. The study adopted a case study approach. Data were collected over 15 weeks through two semi-structured interviews, three stimulated recall interviews based on three sets of student writing analyses, and three classroom observations. Ten student portfolios, including each teacher’s written feedback practices over a semester, were also examined. Teachers’ written feedback on the student writing was grouped based on the scheme by Ferris (2007). The analyses revealed that both participants opted to provide written feedback for several reasons. Additionally, both teachers gave comprehensive corrective written feedback throughout the term for a variety of reasons. The most salient motives behind the practices and beliefs were: i teachers’ attitudes towards writing and errors, and the roles of teacher and students in writing; ii pre-service teacher education and experience; and iii school policies. Alshahrani, A., & Storch, N. (2014). Investigating teachers’ written corrective feedback practices in a Saudi EFL context: How do they align with their beliefs, institutional guidelines, and student preferences? Australian Review of Applied Linguistics, 37, 101-122. Bailey, R. & Garner, M. (2010). Is the feedback in higher education assessment worth the paper it is written on? Teachers' reflections on their practices. Teaching in Higher Education, 15(2), 187-198. Baxter, P. & Jack, S. (2008). Qualitative Case Study Methodology: Study Design and Implementation for Novice Researchers. The Qualitative Report, 13(4),544-559. Beuningen, C. G., Jong, N.H. & Kuiken, F. (2012). Evidence on the Effectiveness of Comprehensive Error Correction in Second Language Writing. Language Learning 62(1), 1-41. Bitchener, J. & Knoch, U. (2009). The contribution of written corrective feedback to language development: a ten month investigation. Applied Linguistics, 31(2), 193-214. Borg, S. (2003). Teacher Cognition in language teaching: A review of research on what language teachers think, know, believe and do. Language Teacher, 36(2), 81-109. Borg, S. (2006). Teacher cognition and teacher education: research and practice. London: Continuum. Bruno, I. & Santos, L. (2010). Written comments as a form of feedback. Studies in Educational Evaluation 36, 111-120. Cohen, L., Manion, L., & Morrison, K. (2000). Research Methods in Education (5th edn). London: Routledge Falmer. Conrad, S. M. & Goldstein, L. M. (1999). ESL student revision after teacher-written comments: Text, contexts, and individuals. Journal of Second Language Writing, 8(2), 147-179. Diab, R. L. (2005). Teachers’ and students’ beliefs about responding to ESL writing: A case study. TESL Canada Journal, 23(1), 28-42. Evans, N. W., Hartshorn, K. J. & Tuioti, E. A. (2010). Written Corrective Feedback: Practitioners’ Perspectives. International Journal of English Studies, 10(2), 47-77. Fazio, L. L. (2001). The effect of corrections and commentaries on the journal writing accuracy of minority- and majority-language students. Journal of Second Language Writing, 10(4), 235-249. Ferris, D. (1995). Student Reactions to Teacher Response in Multiple-Draft Composition Classrooms. TESOL QUARTERLY, 29(1), 33-53. Ferris, D., Pezone, S., Tade, C. & Tinti, S. (1997). Teacher written commentary on student writing: Descriptions and implications. Journal of Second Language Writing, 6, 155-182. Ferris, D. R. (1997). The Influence of Teacher Commentary on Student Revision. TESOL Quarterly, 31(2), 315-339. Ferris, D. R. (2007). Preparing teachers to respond to student writing. Journal of Second Language Writing, 16, 165-193. Ferris, D. R. (2014). Responding to student writing: Teachers’ philosophies and practices. Assessing Writing, 19, 6-23. Ferris, D. R., Liu, H. & Rabie, B. (2011). ‘The job of teaching writing’: Teacher views of responding to student writing. Writing and Pedagogy, 3(1), 39-77. Hancock, D. & Algozzine, B. (2006). Doing case study research: A practical guide for beginning researchers. New York: Teachers College Press. Hartshorn, K. J., Evans, N. W., & Tuioti, E. A. (2014). Influences on teachers’ corrective feedback choices in second language writing. Writing and Pedagogy, 6, 251-282. Henderson, L., Henderson, M., Grant, S. & Huang, H. (2010). What are users thinking in a virtual world lesson? Using stimulated recall interviews to report student cognition, and its triggers. Journal for Virtual Worlds Research, 3(1), 1-22. Hirvela, A. & Belcher, D. (2007). Writing scholars as teacher educators: exploring writing teacher education. Journal of Second Language Writing, 16, 125-128. Hochstetler, S. (2007). The preparation of pre-service secondary English teachers in writing instruction: A case study of three California colleges’ education programs. Action in Teacher Education, 29(2), 70-79. Hodges, E. (1997). Negotiating the Margins: Some Principles for Responding to Our Students' Writing, Some Strategies for Helping Students Read Our Comments." Writing to Learn: Strategies for Assigning and Responding to Writing Across the Disciplines, 77-89. Hyland, F. & Hyland, K. (2001). Sugaring the pill. Praise and criticism in written feedback. Journal of Second Language in Writing, 10, 185–212. Hyland, K., & Hyland, F. (2006). State of the art article: Feedback on second language students‟ writing. Language Teaching, 39, 83-101. Kern, R. (2000). Literacy and language teaching. Hong Kong: Oxford University Press. Lee, I. (2003). L2 writing teachers’ perspectives, practices and problems regarding error feedback. Assessing Writing, 8(3), 216-237. Lee, I. (2008). Understanding teachers’ written feedback practices in Hong Kong secondary classrooms. Journal of Second Language Writing, 17(2), 69-85. Lee, I. (2010). Writing teacher education and teacher learning: Testimonies of four EFL teachers. Journal of Second Language Writing, 19, 143-157. Lee, I. (2011). Working smarter, not working harder: revisiting teacher feedback in the L2 writing classrooms. The Canadian Modern Language Review, 67(3), 377-399. Li, J. (2012). University tutors’ beliefs about and practices in assessing undergraduates’ writing - A New Zealand case study. Doctoral Thesis, the University of Waikato, New Zealand. Montgomery, J. L. & Baker, W. (2007). Teacher-written feedback: Student perceptions, teacher self-assessment and actual teacher performance. Journal of Second Language Writing, 16, 82-99. Noor, K. (2008). Case study: A strategic research methodology. American Journal of Applied Sciences, 5(11), 1602-1604. Orsmond, P. & Merry, S. (2011). Feedback alignment: Effective and ineffective links between tutors' and students' understanding of coursework feedback. Assessment & Evaluation in Higher Education, 36(2), 125-136. Paiva, K. S. F. D. M. (2011). Brazilian English as foreign language teachers' beliefs about grammar-based feedback on L2 writing. Graduate Theses and Dissertations. Polio, C., Fleck, C. & Leder, N. (1998). ‘If I only had more time’: ESL learners’ changes in linguistic accuracy on essay revisions. Journal of Second Language Writing, 7, 43-68. Price, M., Handley, K., Millar, J. & O'Donovan. (2010). Feedback: All that effort, but what is the effect? Assessment & Evaluation in Higher Education, 35(3), 277-289. Stern, L. A. & Solomon, A. (2006). Effective faculty feedback: The road less traveled. Assessing Writing, 11, 22-41. Truscott, J. (1996). Review Article: The Case against Grammar Correction in L2 Writing Classes. Language Learning, 46(2), 327-369. Truscott, J. (2007). The effect of error correction on learners’ ability to write accurately. Journal of Second Language Writing, 16, 1-18.